Nothing says good morning like a cuppa and a good breakfast of eggs and soldiers, and what better way to present your eggs than in these adorable egg cups? 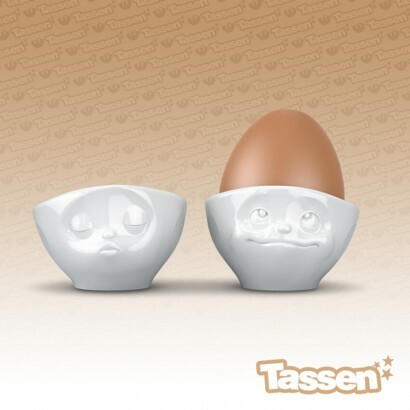 Made by Tassen in Germany, this pair of egg cups compliment the Tassen breakfast range with adorable dreamy and kissing expressions. Made from polished white porcelain, they're dishwasher and microwave safe and bring a touch of personality to your breakfast table expressing your emotions when you're too sleepy to!